Software giant Adobe has launched new software that reduces waste and cuts printing costs by an average of 40%, it is claimed. Adobe's LeanPrint automatically minimises the amount of ink used to print documents and so reduces office print bills by 40%, laboratory tests show. Toshiba is so impressed with the software that its America Business Solutions has agreed to partner with Adobe and distribute LeanPrint to its customers across the continent. Senior director and general manager of Adobe's Print and Scan Business, Raman Nagpal, says, "Adobe has always prided itself on environmentally conscious behaviour, from its LEED Platinum certified buildings to its carbon offsets." LeanPrint is part of Adobe's pledge to bring down printing costs and works by improving the fine-tuning of ink use in both laser and inkjet printers. The software is compatible with popular programs including Microsoft Word, Adobe Acrobat and Reader as well as well-known browsers. Users are able to see a preview of the output so they can be sure of a top-quality print-out. LeanPrint features Toner Saver and Super Saver option that uses even less materials and the My Savings option on the print preview display shows exactly how much is being saved over time. Savings by various groups of people can also be identified. If required, managers can ensure users print in the most economical way by using double-sided printing. Toshiba America Business Solutions vice president of marketing, services & solutions, Bill Melo, says both Toshiba and Adobe are at the forefront of using new technology that helps conserve resources and save money. A 30-day trial of LeanPrint is available to individual users and a 90-day trial to businesses and organisations. To find out more go to LeanPrint on the Adobe website. 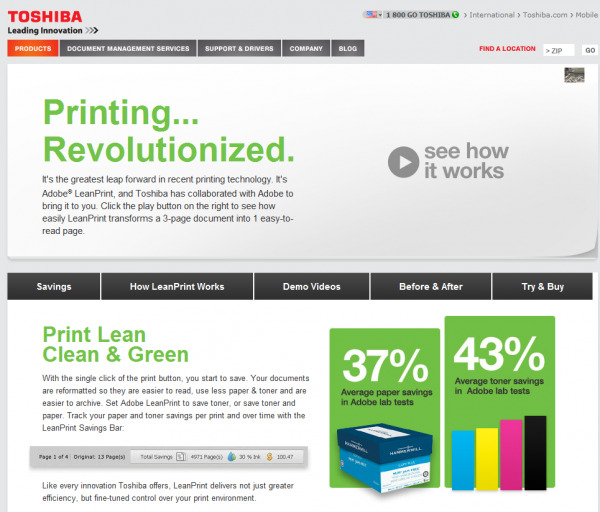 A video of how Toshiba is rolling out LeanPrint is also available.